Embrace the shadows! Whether from the subterranean wilds of the Darklands or otherworldly realms of absolute shadow, heroes can rise from the darkest places. 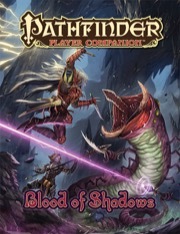 Pathfinder Player Companion: Blood of Shadows explores the strange paths and subtle abilities empowered by darkness. Discover the secrets of drow, fetchlings, and wayangs—races infused with lightless powers. Within this player-friendly volume are options and secrets for characters of every class, including a penumbral psychic discipline, shadowy rogue talents, and an oracle mystery that plumbs the depths of darkness. Expanded favored class options and alternate racial traits for three races with strong ties to darkness and shadow: drow, fetchlings, and wayangs. Shadow-themed archetypes, including the dusk knight, the gloom chymist, the shadow walker, and the umbral scion, as well as shadowy feats, spells, and magic items. Shadowborn traits available to members of many races, representing characters with just a trace of shadow in their blood. There are a lot of nice options here, but I can't bring myself to give this a higher rating because of uncorrected mistakes. It reflects poorly on the entire work to have a non existent feat listed as a prerequisite for this long without an official correction to the content. I understand that mistakes will be made, but for this to have been out for a full year and still not see the prerequisites for Blinded Master fixed in any way. No errata, blog post, or FAQ entry. Mistakes happen, but I can't believe this has not been mentioned before with the amount of time it's been out and the number of rules lawyer people who play this game. Blood of Shadows gives dark-loving players what they want! Thisis a 2016 release from Paizo Publishing as part of its Pathfinder Player Companion series. The cover of this one is by Kiki Moch Rizky and, as is usual in this series, there are several authors. This one is available as both a pdf and a 32 page softcover. I'll be focusing on the print version which is staplebound with thick covers. The entire volume is on glossy paper and in full color. The editing is generally top-notch and the artwork and layout are excellent. The theme of this tome is shadows and darkness; more specifically it focuses on providing new options to characters who spend (or have spent) a lot of time in the shadows. It mentions some of the creatures you'd expect, but it's really focused more on what happens when races who normally live in the light must instead live in the dark places of the world. Predictably, it starts out with an introduction which lays out most of what I said in the previous paragraph. It also includes the standard rules index for new rules in this volume. There are a handful of archetypes, about 20 feats, and about 20 other rules options. The first chapter talks about alternate racial traits available to those who have lived in shadows or light. There are traits for each of the main races of the core rulebook and they are provided with both replacement traits and points for those using the point build system. Transformed by Shadow covers new traits and feats for Fetchlings and provides new rogue talents usable by fetchlings and by other thieves and the chapter ends with a new archetype for fetchling rogues. The next chapter is a bit of a reversal and covers the Wayang, creatures from the plane of shadow who are now trapped here. There are new racial traits, feats, favorite classes, and even spells. There's a new eidolon subtype called Shadow. There's also information on Shadow Ink Tattoos and a new path for Oracles: Shadow. Transformed by Darklands introduces Dro and Half-Drow characters. It provides new racial traits, favored class options, feats, spells, and rules for Shadow as a bloodrage bloodline, psychic discipline, weapon blessings and subdomain. Shadowy Archetypes provide new Archetypes for shadowy paladins, alchemists, and sorcerers with appropriate ability changes for each. Fighting in the Dark provides some general and specific tactics for fighting in the dark. It ends up with a selection of magical items which provide light in a variety of ways. The next few sections provide a couple of pages each on Shadow weapons, shadowy feats, magic items with a shadowy theme, and spells with a penumbral and a shadow theme. I've never read a Drizzt book, so I may not be the core audience for this supplement, but that doesn't matter. I think a lot of people think about what it would be like to be a shadowy man from a shadowy plane(t), and this book gives you the chance to do just that. There are plenty of options for standard races to be just a little different than their light-loving peers. I think there are a lot of neat ideas here and the book is nice and thorough with shadowy touches for nearly every class and every race in the core rulebook. If you want to be Drizzt or a medieval Riddick, this is your chance. I really enjoyed this one. It provides good options for select dark/shadow focused races, shadow options for classes (oracle mystery, alchemist archetype, rogue archetype, psychic discipline), theoretical guidance on using and defending against darkness as an environmental weapon, and new gear and spells that provide fun, creative new options. Highly recommended to flesh out existing character concepts or inspire a shadow themed party or campaign. Announced! Product image and description are not final and subject to change. Huh? Neat! I didn't expect this at all, but it should satisfy many of a people's itch. Wayang love! Thank you! I look forward to getting some more ideas of how to use them in PFS. Sweet! Glad I'm holding on to my Fetchling. Maybe I'll finally create him. Well the last couple of the Blood of X have been...lacking I hope this one is better. yeah wondering if this will have info on the Caligni, the 0HD darkfolk race in the upcoming Bestiary 5. This looks like fun. I like shadow-themed characters. I hope some of the spells will be added to the Occult class spell lists. Seems abit stretched, trying to cover so many races. I always like the race themed books. I hope there are options in here for all shadow-themed characters. Not just for the races presented therein. I hope there are some gnome options! Seems like paizo (and posters) have forgotten that the "Blood of" Line was originally focused on giving cool options for a specific race, sad to see it change into a more generic player companion. Awesome! This is probably the first "Blood of" book I've looked forward to. Arrgh, now if I could only play a kayal in PFS. I think the worry is, say you make a book just focused on Wayang. How many people are interested enough in Wayang to buy an entire book on the subject? Doing two or three races as a focus is more likely to attract buyers than focusing on one minor niche race (which is pretty much what Fetchlings and Wayang are really). I understand that, though I don't see why it should be a "Blood of " when it's more than one race. The line has been diluted from it's rather cool origins with Blood of the Elements (which is understandable to a degree since all of those races were genie-kin), but now it's going even further with simply "Races with a darkness theme". Hopefully it will be a good Player Companion, there are some great developers around. But to me it will not be a good "Blood of" book. Fetchliings are outsiders that are native to the Plane of Shadows. Wayang were outsiders that were native to the Plane of Shadows that got stranded on the Material Plane after the Age of Darkness ended and were forced to, "Go native." Every other race is, for now, a speculation on forum-goers' part. It is difficult to claim that this product is going to go with a "races with a darkness" theme when we don't know what's going to be in it yet. For all we know, the book might focus on those two races, plus humanoids whose ancestry was tainted by the Plane of Shadow. For instance, we could see some heavy Kuthonite love in this book for that very reason. I think the point is, you're telling everyone that the Titanic is sinking before its even left port. Give the product a chance; maybe Blood of Shadows is the alternate timeline where Balthazar saves the Titanic in order to ensure that Celine Dion stays in Canada and never sings her famous hit song, "My Heart Will Go On." I think the point is, you're telling everyone that the Titanic is sinking before its even left port. I'm not. This book can be great and amazing, I hope it will be, and I have faith in the developers and freelancers that they will produce a product to the same quality as other player companions. But to "me" it will not be a good "Blood of" book, because it's left the origins of "Blood of" books behind to a degree that I am disappointed with. In retrospect, that would have been a good idea. There is also a chance that the new darkfolk race will get some love or maybe some unknown shadow themed race from B5. Zathras thinks what you ask for you truly do not want. At least not without Vorlons around as backup. Oh...we are getting info on the Drakh and Zenner? More Fetchling stuff? Sounds good to me! And I always love new archetypes. Because many compare them to the blood of... books for Aasimar and Tieflings, expecting similar scopes of options as in those books. Blood of the Moon and Blood of the Elements both were pretty good. The only thing i really didn´t like was how the "surprising combatant" feat from Blood of the Moon was made unusable. It was really cool conceptwise before! How about making something like that, but instead of rolling competitive checks making it beat DC? I hope I'm not the only one hoping for more shadow casting stuff like Shadow Conjuration and Shadow Evocation. I always loved those! I would love some more shadow magic, and also light based magic, moon magic, and star/cosmic themed magic. I love Blood of Angels and Blood of Fiends, I think they have the perfect mix of rules mechanics and general information. They're the golden standard I hope to see in other Player Companions and the books I compare against when I read the other ones. Variant Heritages are a brilliant addition and they're a big part of why my players frequently play these races at my tables. Blood of the Night is interesting, but for a player companion I think it's a bit too focused on providing information and options for vampires despite outlining exactly why allowing PC vampires is a really bad idea. At times I felt it strayed from "player companion" material and into GM material. Blood of the Moon... Hm. I'm normally very much a rules guy, but I think this book actually went a little overboard on mechanics and left me a little unsure exactly how skinchangers fit into Golarion. Minor pet peeve of mine, but I really wish the way the race names is presented was reversed. Coldborn, Ragebred and Scaleheart sounds awesome, but werebear-kin, wereboar-kin and werecrocodile-kin sounds uninspired and kind of lazy. I found Blood of the Elements a bit too unfocused. About half the book contains information on the elemental planes that isn't terribly relevant or interesting for players making a new character that's likely to spend most of his time on the prime material plane, and the rest of the book stretches itself thin trying to provide options for five different races that frequently diametrically oppose one another - for example the ifriti options will be completely irrelevant to an undine. I'd have preferred to see the book focus on fewer races, or put the elemental plane information in a separate Pathfinder Campaign Setting softcover akin to Distant Worlds. Then I'll immediately contradict myself by saying that I think it's really cool they included a page for the City of Brass! I suspect part of the reason why Blood of Angels and Fiends are so popular is that they each focus on a single race, which means all the information in the book is valuable and relevant to someone making a character of that race. By comparison only about 20% of Blood of the Elements is useful for a player making, for example, an undine character. I realize you've already decided the focus for Blood of Shadows, but I figured it's worth mentioning. I really really hope to see a Blood of the Coven book that explores Changelings! Finally, congratulations on developing your first "Blood of..."-book! My issue with the Blood of x books lately have been the mechanics have been too tightly focused. For instance in the Blood of the Elements if you were not playing the one class that the particular race got mechanics for those books were kind of useless to you mechanically speaking. The mechanics should be more tied to race that ignore class...or it should have more option for more than one class. Maybe cut out magic spells and magic items for room. Maybe cut out magic spells and magic items for room. I agree pretty much with Kudaku. Angels and Fiends were fantastic because they had an entire book dedicated to one race with heaps of crunch and fluff. After setting the bar with Angels and Fiends, everyone was expecting the same treatment for other half-human races. But with Night we got mostly Vampires when everyone wanted Dhampirs. If the variant Dhampir races had been omitted, I think it would have gotten even worse reviews. Moon was pretty good, but introducing a new race has it's issues as well. With Elements there wasn't enough crunch for each race for a Player Companion line. Angels and Fiends could get away with more fluff because they were only one race. But with Elements, I think people wanted the same amount of crunch for EACH of the five races that Tieflings and Aasimar got. Obviously that was never going to happen in a 32 page book. But I would have been immensely happy if Elements was mostly crunch (say 4-5 pages per race) and then just the bit on the City of Brass and an overview of the planes for fluff. In a post above I asked for options for other races which kind of contradicts what I have said here. That's because I'm not sure if Wayangs and Fetchlings have enough excitement to hold their own book. However, I would love to be proven wrong and have the entire book just for actual shadow races that is as good as Angels and Fiends. I will say that I don't think every race needs an entire book to themselves. Changelings are my all-time favorite race - they practically got me into Golarion. I adore them. But a 32-page changeling-only book would be overkill, in my opinion. Same for strix, or grippli, or (I'm going to be murdered for this) vishkanya. I think this book could be on the right track, if it avoids the pitfalls of Elements and Night. Don't make it a gazetteer of locations, or a guide to playing monster races, or a grab bag of random options for just anyone. Tell us how these races live, give each of them some solid attention. Above all, stay focused. Blood of the Wild: Catfolk, vanara, maybe a tiny smattering of others. Like, two pages of stuff (altogether) for kitsune/nagaji/ratfolk. The amount that Dirty tactics Toolbox gave for racial options. Blood of the Sea: Merfolk and gillmen. Some "fighting underwater" rules clarification. A tiny bit for other watery races. DO NOT introduce a new race. Blood of Deceit: Changelings, vishkanya, and kitsune. Three races is a big split - keep it focused! PS: Oh, all right, I suppose you can do an all-grippli book. But only if you get James Sutter to write it. All of it. People of the Stars was also lacking in crunch for the actual alien races but was still good. I agree, I haven't seen race books as good as the angel and fiends ones but they did have the advantage that they were focused on one race. They also had a better format then the books that followed. In my opinion the most important thing is to have something for everyone. New options for races are great but if everything is race specific, this book will likely have limited use. I have so far(I do plan to get them all eventually) only Blood of Fiends and that is awesome book, but Blood of Elements is low on my priority list since I heard it tries to give info on elemental races and elemental planes on same time and lack of focus gives no justice to either. I'd rather buy blood of books for race info and have planes info in seperate book so both get focus they deserve. Yeah, blood of elements did lack focus and blood of the night focused way to much on vampires and not Dhampir. Not to nit-pick, but can it instead be named something like Blood of the Cunning? "Deceit" implies an innate distrustfulness and deceptiveness in these races, which bugs the hell out of me. More to the point, why haven't we had a Blood of Slaad book yet? Slaadi are imprisoned behind the Great IP Wall, and thus cannot be summoned into Paizospace. I hear being a protean is pretty sweet though. Up ahead Kalindara made some great points, there is just not enough information about how these two unique races interact with the rest of Golarion and I'd like more information of that nature. You don't have to give me 4 sub-par items that'll see little use, I'd rather see more information about what its like to be an adventurer of this race, maybe some notable Wayang or Fetchling adventurers that are roaming about as well. I know Wayangs are a mostly Tian race but I'd like information for what it is like for them to adventure in the Inner Sea as well, what kind of reception they receive from the inner-sea races. Traits, feats and spells are always nice to I guess. I won't tell you not to be bothered by it - that's not illegitimate. The problem is, "distrustfulness and deceptiveness" seem to be in the nature of the listed races, to a major extent. Changelings, especially the green widow (which the fluff seems to paint as the default), are literally creatures of deceit. First at conception, again at the crib swap, and seemingly throughout their lives. Vishkanya and kitsune both have available racial traits focused on disguising themselves as human. Existing vishkanya options are almost myopically focused on that one idea. Kitsune are painted heavily as tricksters and deceivers as well. Maybe I'm reading too much into things... but I think of it as tiefling-esque. You can play a tiefling paladin, but you're playing against a stereotype. Nothing wrong with that.